Fixed an issue that caused sims to reset when making Condensed Milk with milk from EA's Milkin' It Dairy Corral in games where Cinderellimouse's ingredients mod was not installed. "Make Condensed Milk" should now work even when only the Dairy Corral is installed. Removed reference to non-implemented scone texture. 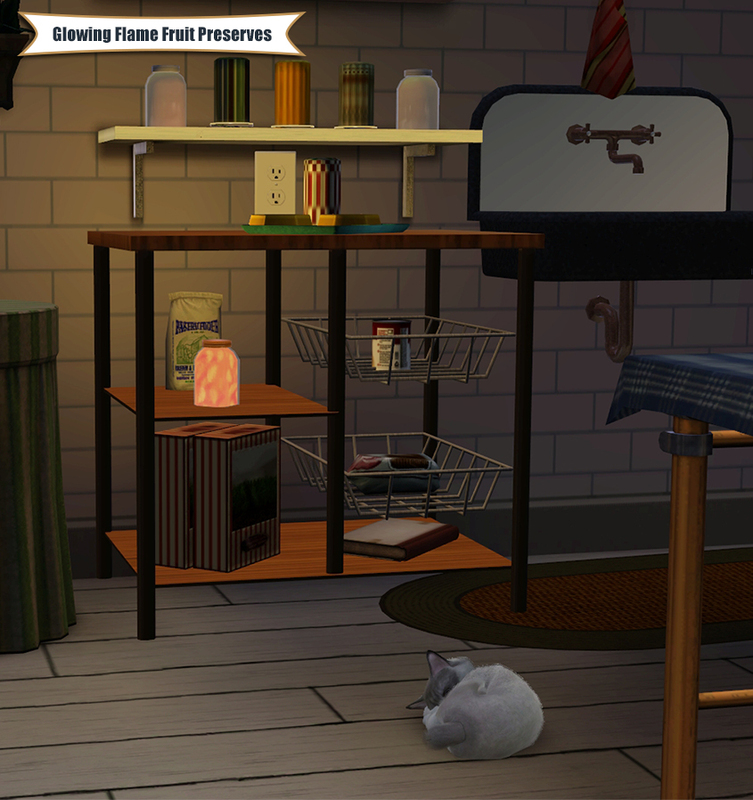 The Canning Station Overhaul introduces new features to Grandma's Canning Station from the Sims 3 Store. It also fixes a number of existing bugs in the item. Fixed a bug whereby jams/preserves were corrupted by sims vacationing with them in the inventory, by moving a lot/sim with them through Edit Town's clipboard, by saving a lot/sim with them to the Library--in essence, any action involving import/export. 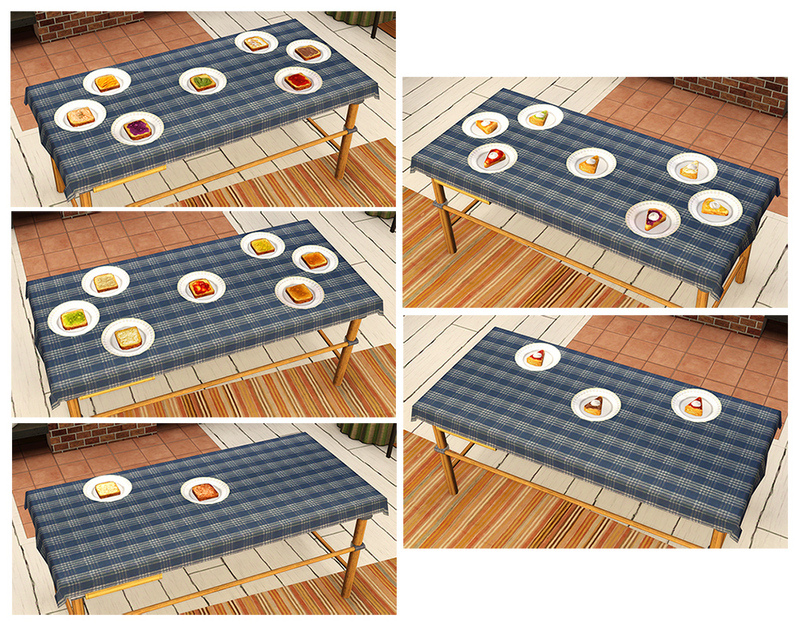 The corrupted jams and preserves lost their thumbnails and tooltips, and caused sims to reset while running the "Eat with Scones" interaction. 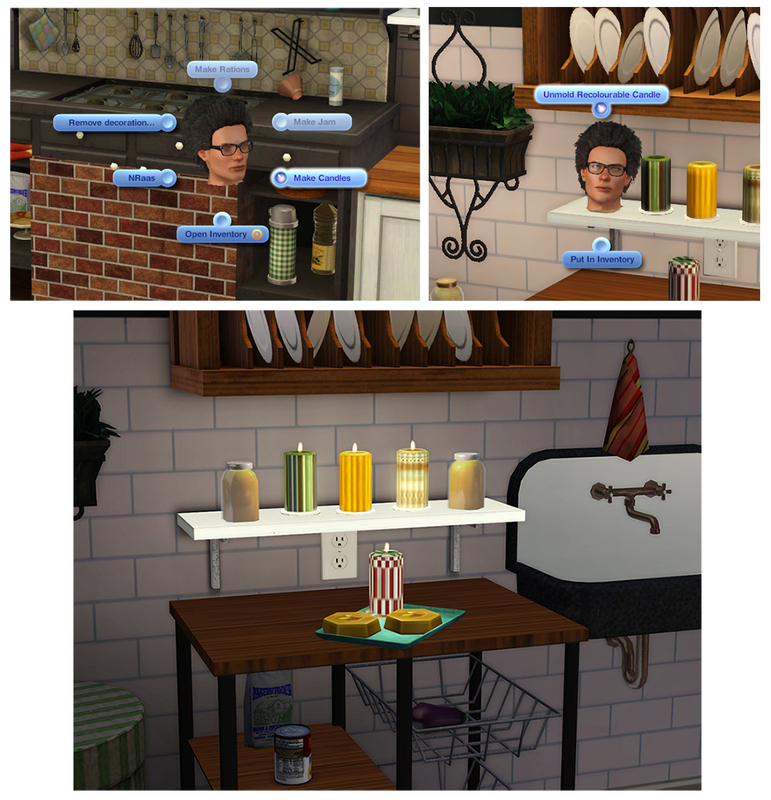 Sims with corrupted jams/preserves in their inventory could not perform social interactions with other sims in their household. Additional documentation of this bug can be found here and here. "Open Jar" interaction is now enabled for children. Inventory thumbnails of jars now show the jar lid. Jars from the canning station can now be rotated and placed on most wall shelves. Discussion of the placement issue can be found here. Fixed a bug whereby the "Eat with Toast" interaction was not available unless the Baker's Station was installed. Fixed canning station decorative slots so that they can accept more types of objects and are no longer rotated backwards. All toasts and scones made with default EA jams now look like they're spread with a variety of different jams. Unmodded, all toasts and scones use the same reddish-purple jam texture, regardless of the actual jam consumed. Twelve custom spreads can now be made using ingredients that were previously not accepted by the canning station. They can be eaten with toast only. Each custom spread results in a different custom toast (see toast screenshots above). "Make Rations" is a new interaction that cans a meal, storing it in a jar to delay spoilage indefinitely. This interaction is enabled once 3 meals have been added to the canning station's inventory. These can be a mix of any 3 types of meals, any number of servings, any quality. 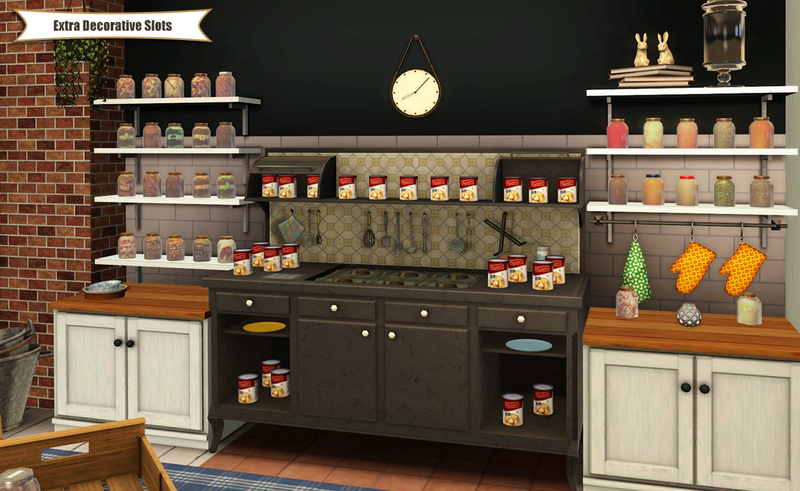 Ration jars have an "Open Jar" interaction, which respawns the meal into the sim's inventory in the same state as it was when put into the canning station, with the same number of servings and quality. 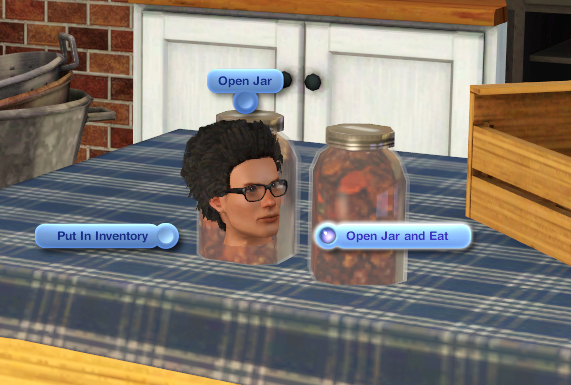 Vampire sims will not autonomously "Open Jar and Eat" from rations jars whose meals do not contain plasma fruit as an ingredient. The player can still direct them to do so, however. 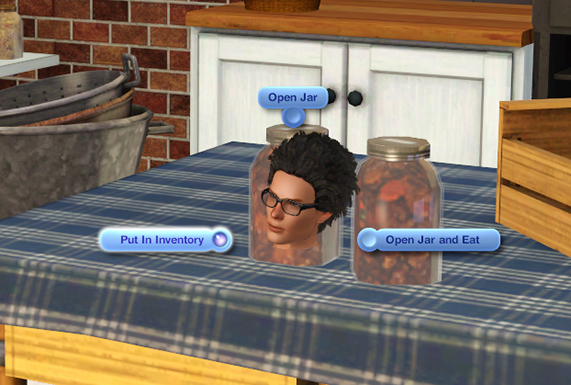 Both "Open Jar" and "Open Jar and Eat" are enabled for children, except when the ration jar contains a meal that is tagged "adult-only" by EA (i.e. mac-and-cheese, autumn salad, waffles)--in this case, only "Open Jar" is enabled for minors. Seventy meals have individualized ration jar textures. All other meals have ration jars that sport a custom generic texture with a silver lid, labelled "FOOD". 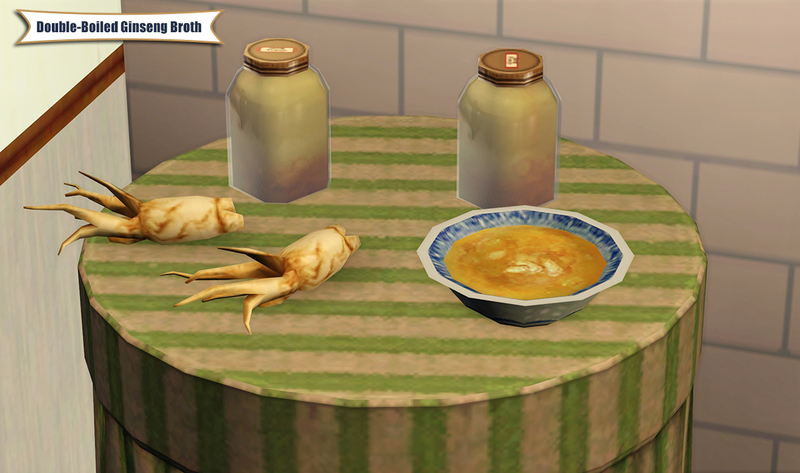 Double-Boiled Ginseng Broth is a new recipe made by adding 3 ginseng ingredients to the canning station's inventory. Sims get the "Warm Fuzzies" moodlet after eating the broth. 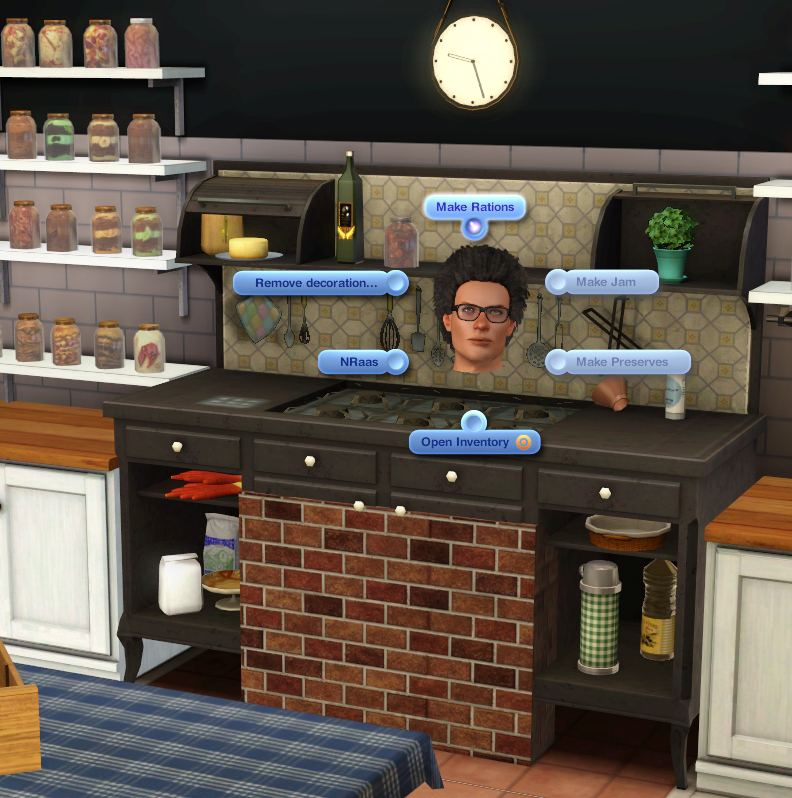 The "Germy" moodlet is removed by the broth if present. Jars of flame fruit preserves now glow. Make candles by adding 3 beeswax ingredients to the canning station's inventory. Click on the resulting jars to "unmold" the candle. This candle uses the mesh from the basegame Mood-Lite candle, but is CAStable with 2 channels and 3 presets, and has a transparent glass base. It's not a default replacement. It's not buyable via the catalog, but can be sold for 85 simoleons. A "Put in Inventory" interaction has been added to all canning station jars so that they can be moved to the inventory without being opened first. 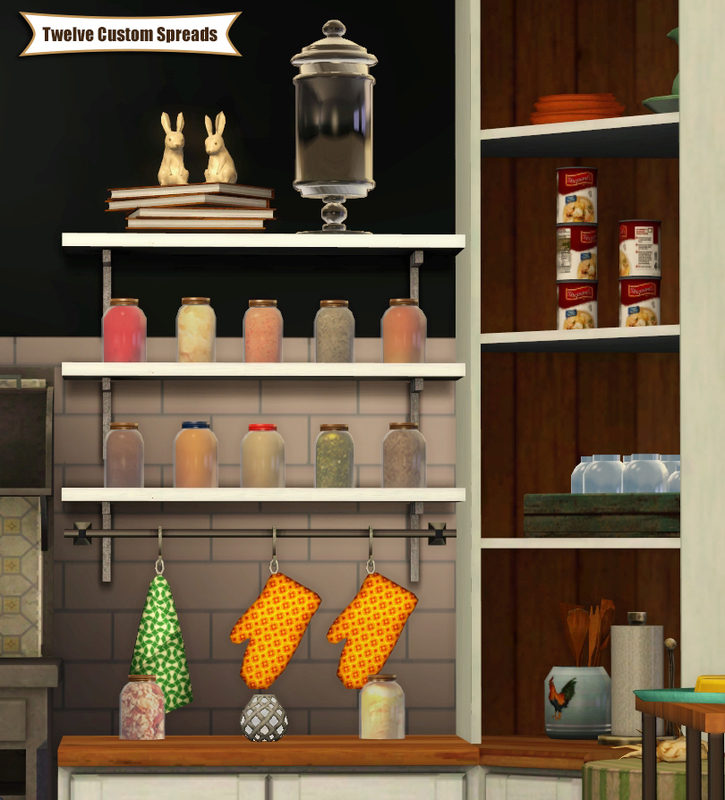 If Grandma's Canning Station was installed via the Launcher as a .sims3pack: unpack mod as usual into Mods/Packages folder. If Grandma's Canning Station was installed as a .package: unpack mod into Mods/Overrides folder. If StoreFix_Decrap_Fixes.package is present in Mods/Packages or Mods/Overrides: the canning jar slot placement and rotation bugfix from this mod will not work because its canningJarJam OBJD is overridden by the one in StoreFix_Decrap_Fixes.package. This is easily remedied by firing up S3PE and setting the SlotPlacementFlags to Small, Decorative, and FullRotation in the OBJD in StoreFix_Decrap_Fixes.package. 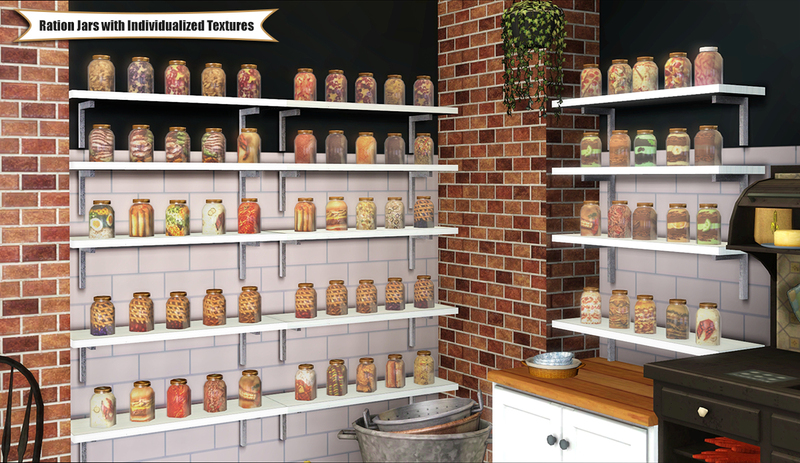 Uninstalling this mod will break the custom objects it creates, such as the ration jars, custom spreads, unopened candle jars, Double-Boiled Ginseng Broth jars, and the custom CAStable candle. Sims who are opening ration jars autonomously might also be affected. It's likely best to delete the objects generated by this mod prior to uninstalling, and to run NRaas ErrorTrap when loading the savegame for the first time after the uninstall. This mod was built on patch 1.67, tested mostly on patch 1.67 and partially on patch 1.69. 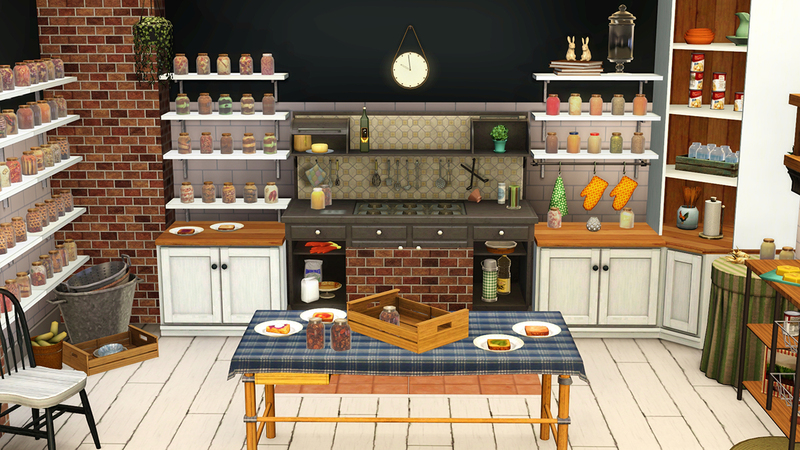 Non-basegame ingredients and recipes require their respective expansion packs or Sims 3 Store content, but they are not absolute requirements for the mod itself. Below are resources modified by the Canning Station Overhaul. Mods that also affect these resources will cause a conflict. Snacks (e.g microwave/fridge quick meals) cannot made into rations. The only exception is microwave Ramen (from the University EP) which is explicitly handled by "Make Rations". Delivery pizzas cannot be used to make rations. Pizzas from the Wood Fire Oven are OK. Individual cake slices can be made into rations, but not whole birthday or wedding cakes. Meals with added herbs will lose the misty "herb added" visual effect as soon as they're dragged into the canning station. 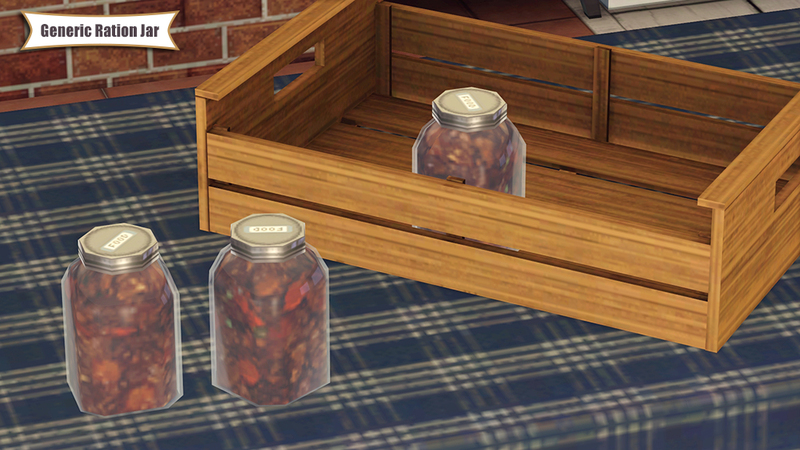 The effect will not return when these ration jars are opened, but sims will still get the moodlet associated with the herb when eating the opened ration. The loss of herb effects appears to be due to how inventories are implemented by EA (if anyone knows more about this, please contact me.) Flame fruit effects are persisted, however. Toasts made from this mod's herb-based custom spreads (i.e. Cinnamon Spread and Pesto) will give the appropriate herb-specific moodlets when eaten. The misty "herb added" visual effect has been disabled by design in this case, since it looks misplaced when the toast is lifted away from the plate while eating, due to the effect being associated to the plate rather than the toast. 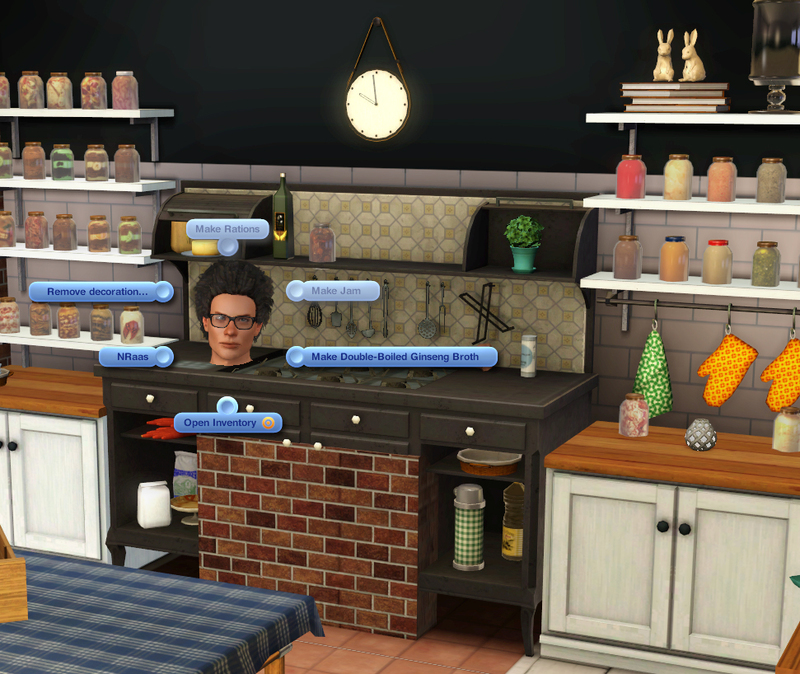 Uninstalling expansion packs, Store content, or mods whose ingredients or recipes have been used to make rations or custom spreads will break the affected jars. Testing suggests that these jars will become functional again once the relevant EPs/mods/Store content are reinstalled, but such an uninstall is not recommended. Do not re-upload elsewhere or include with lots. Do not use custom assets or code in this mod for derivative works, including conversion to other Sims games, or extraction/recategorization of custom objects to make them buyable from the catalogue. This mod is made possible by the generosity, enthusiasm, and resourcefulness of its testers: attuned, Frogsnack, icemunmun, igazor (check out the utterly charming testing Simblr), lucy kemnitzer, Misty_2004, sydsyrious, and tangie0906.